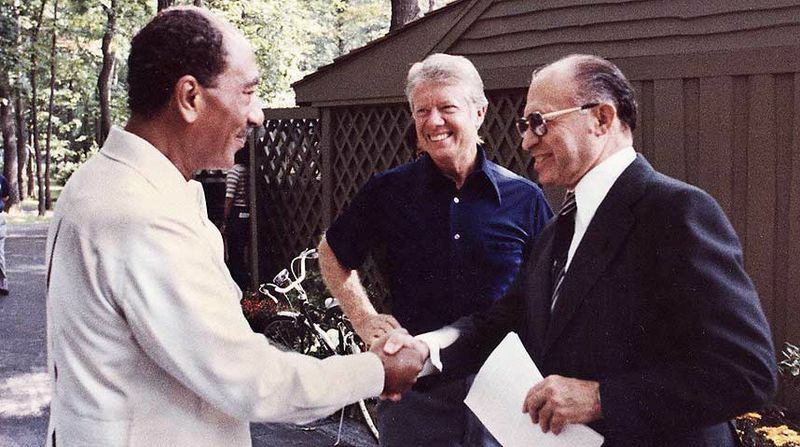 ... 1978, was reported a "breakthrough" in Middle East peace negotiations between the leaders of Israel and Egypt, Menachem Begin (right) and Anwar al-Sadat (left). Meeting at Camp David, Maryland, with U.S. President Jimmy Carter (center), Begin and Sadat agreed: 1st, that Palestinians and others resident in the West Bank and Gaza have a right to self-determination respecting those territories; and 2d, that Egypt would recognize the state of Israel "in return for Israeli military withdrawal from Sinai." (photo credit) Despite the optimism evident in the 1978 BBC report quoted above, as this recent article and IntLawGrrl guest/alumna Yaël Ronen's post demonstrate, the need for full settlement of the Israel-Palestine dispute continues to this day.